The projects goal is to secure the food and nutritional security of orphaned and child-headed households. A wide variety of activities ensures a sustainable impact. HALISK stands for Hope in Agriculture and Life Skills Development for Kabarole. 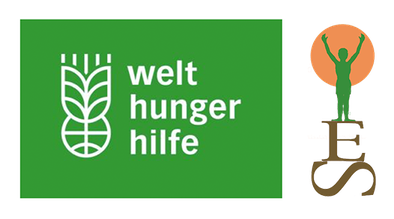 The project is funded by the German NGO Welthungerhilfe and hosted by us. We implement the project with constant support of our international partner. The project key objectives are to contribute towards improvement in the food and nutritional security among our target households and communities within the area of operation in Kabarole district. Microcredit, vocational skills training and certification as well as psychosocial support are all an integral part of HALISK. For the selection of our beneficiaries Y.E.S provided a reliable database of households that either have an orphaned or vulnerable children as a member. In addition during the first phase of the project we cooperated with the lower local government and community leaders to identify families that fit the criteria. We made sure that the group members were also self-selected by the communities in order to guarantee self-determined formation. In the beginning we started with 120 families. Nowadays 929 people in total are benefitting from the project within the theme groups. The program setting includes four parts, build on one other and with the same greater goal to improve food and nutrition security. The components of our work are VSLA (Village Savings and Loan Association) Groups, Vocational Training, Training In Agriculture and Lifeskill Training. The idea the VSLA groups is to empower communities to improve their financial flexibilities outside the reach of formal institutions. We care for 31 groups with a average of 30 members to offer savings and credit services. Our social workers attend the weekly meetings of the groups and train them to run independently. Every group member has an identification number and a record book to be able to relate to the current amount in treasury and granted loans. The groups have an individual institution that determines interest rates, rules, criteria for membership and other settings. At the end of a cycle members benefit from the share out and gained interests. The loans are used to pay for a business boost, urgent medical treatment, school fees and individual needs. The Vocational Training targets the youth. We are currently supporting 45 people in training. We work together with local carpenters, garages, tailors, hairdressers, welders, mechanics and knitters. The training takes about 7 months and is accomplished by passing a practical exam. The apprentices receive a Worker’s PAS (Practically Acquired Skills) that certifies the skills and competences and is recognized within the Ugandan Vocational Qualifications Framework. Employers can search for potential workers holding the PAS which helps to get our beneficiaries into work. The program covers training costs as well as for required equipment, cloth, tools and a daily lunch for each of the apprentices. The Farmer Field School groups currently contain 348 people from different households to increase the outreach. The individual groups have 3-9 members. The goal of the training is to imparting agricultural knowledge to produce more food for both consumption and for income generation. The training covers theoretical and practical aspects and the group members are suppose to share the knowledge with the their households. At the starting phase of the project we provided seeds, livestock and cultivation methods as base for our work. Our agriculture extension workers are going into the field on a daily basis to train, monitor and implement the projects content. Our Lifeskill Training covers the psycho-social aspect of the project. About 120 of the youth attend our trainings that covers aspects of self-awareness, self-esteem, assertiveness, coping with emotion and stress as well as knowledge of knowing how to live with others in terms of friendship formation, empathy, negotiation or effective communication and more. The attendees are selected by the communities and our social workers. The trainings take place in our office on a regular basis. How does our work look like? Check out the gallery and see how the different components of the projects look like.